Use of open educational resources (OER) has picked up steam in higher education in recent years. 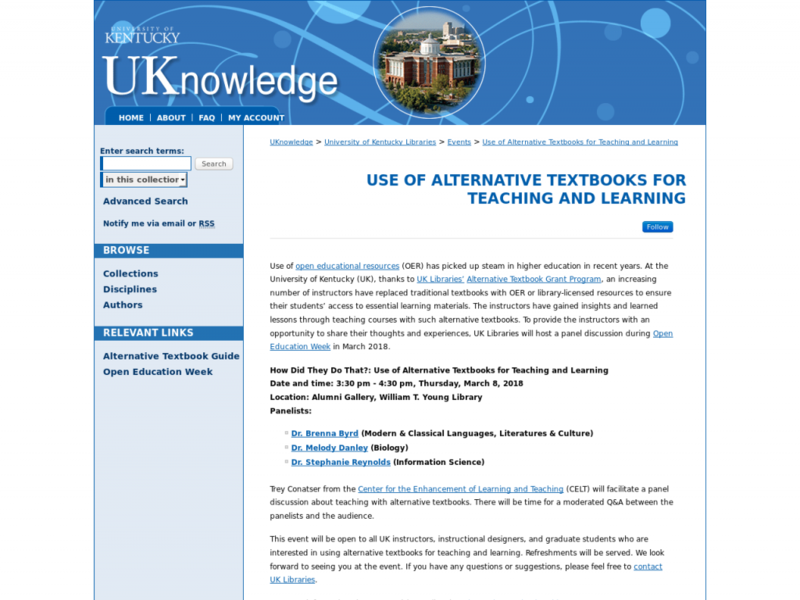 At the University of Kentucky (UK), thanks to UK Libraries’ Alternative Textbook Grant Program, an increasing number of instructors have replaced traditional textbooks with OER or library-licensed resources to ensure their students’ access to essential learning materials. The instructors have gained insights and learned lessons through teaching courses with such alternative textbooks. To provide the instructors with an opportunity to share their thoughts and experiences, UK Libraries will host a panel discussion during Open Education Week in March 2018.